B. Engage in massive financial fraud that nearly wrecks the global economy and requires unprecedented trillion-dollar bailouts from taxpayers to prevent total system-collapse. fascist) police state ruled by a predatory Bankster elite, where the government is little more than a money-funnel to deliver social and natural capital into the Banksters’ grubby little hands. 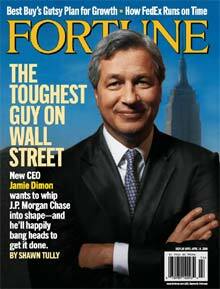 And as can be imagined, no matter how often the Banksters are exposed for flagrant fraud and malfeasance, not a single high-level executive will be sent to jail. 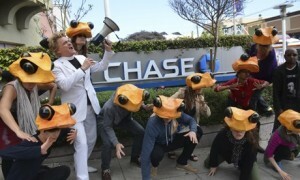 But, alas, Brooklyn’s own Reverend Billy (aka Bill Talen) now faces a one-year jail term — and, yes, for leading a “frog attack” against a Chase Manhattan branch office, along with the Church of Stop Shopping’s choir leader, Nehemiah Luckett, who also faces a one-year sentence. In late September 2013, Talen and Luckett led a dozen or so comrade-activists into a J.P. Morgan Chase office in midtown to burst into song and sermon in protest of the bank’s financing of environmentally destructive industry. Within minutes following the performance, Talen and Luckett were arrested. Nonviolent civil disobedience against the Banksters’ War on Nature brought charges of riot in the second degree, menacing in the third degree, unlawful assembly, and two counts of disorderly conduct. At a recent hearing, their trial date was set for December 9. To donate to Reverend Billy’s Legal Fund click here. Join the 10,000 who have signed petition to Manhattan D.A. to drop charges here.